If you are looking for your Cherokee roots on the rolls, this is a great resource. Intended for the do-it-yourself researcher, both Cherokee Roots volumes give researchers a great start when approaching the Cherokee rolls. About the Author: Bob Blankenship is an Eastern Band Cherokee genealogist and Tribal Council Member. He has published several books on Cherokee genealogy and is the President of the Museum of the Cherokee Indians. 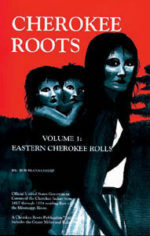 All Things Cherokee Recommendation: The Cherokee Roots volumes are an excellent start if you are researching your Cherokee roots in Oklahoma or North Carolina. The books are just an index, and will require additional research into your family tree, but they’re a handy reference for looking up your ancestors and trying to find that link to the rolls.